The new United Nations Development Programme’s PACE project, which will support and assist the DRC electoral cycle from 2007 to 2011, was launched in Kinshasa on 4 October 2007. Initially the US$151 million project aims to assist and support the organisation and holding of the DRC local elections, envisaged for 2008. UNDP country director Mr. Babacar Cisse, UN agency coordinator in the DRC Mr. Ross Mountain, as well as Independent Electoral Commission (IEC) President Fr. Malu Malu were present at the launch of - PACE - the Project of Assistance to the Electoral Cycle in the DRC, held in the IEC’s headquarters in Kinshasa. The DRC envisages the holding of local elections and the creation of a National Independent Electoral Commission (CENI), which as a replacement for the IEC is mandated by the new DRC constitution to organise future elections. The PACE project’s first goal will be to assist the CENI to complete the identification and registration of voters, and to hold the forthcoming local elections. In addition, PACE aims to reinforce the capacities of the CENI and its structures (with a particular focus on aligning the electoral lists and the installation of a permanent electoral file); to support the installation of a resource and training centre and to reinforce CENI’s partnership with other institutions. “We have already established competencies to support the elections, which will be transferred soon from the IEC to the CENI, to launch the activities of this new institution,” he added. “After 40 years, it is essential to sow the democratic process, not only at a national and provincial level, but at a local level. In this way, the people can elect their own representatives in order to take part in a real and complete democratic process,” he added. 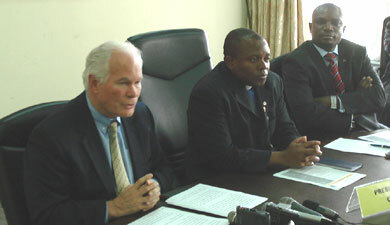 “We need to work hard so that competent electoral administration becomes a reality in the DRC. In particular we must prepare the local elections, but we must begin preparing today for the general elections in 2011. It is therefore a big challenge for us,” he added. Among the challenges for the DRC local elections include the management of over 200,000 candidates, compared to 22,500 candidates for the 2006 elections, as well as the compilation and verification of results, all of which have to be done at a local level.